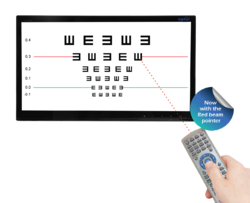 The SmartVision LED Vision Chart is maintenance free and offers numerous advantages over conventional chart projectors and other available visual acuity systems. Regular 20' Distance Eye Chart is made on non-reflecting, matte finish cardboard and has a brass eyelet for wall mounting. This classic visual acuity chart measures 11" wide by 24" high. The Snellen's Letters are designed to be read at a standard testing distance of 20 feet. Regular 20" Distance Eye Chart is made on non-reflecting sheet, Distance Visual Test for testing at 20 Feet, Includes red green bars, a brass eyelet for wall mounting. The vision charts and drums from the house of TME come known for the accuracy of print and good non-fade material. We offer many variants in many popular shapes and concepts. Our designs come tested along industry standards for maximum utility and promise a reasonable pricing on them. Being a leader in this industry, we are devoted towards providing a premium quality array of Visual Acuity Testing Chart. 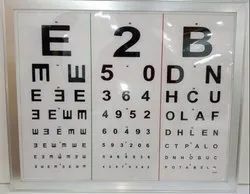 Long Distant Vision Testing Charts in various languages. Regular 20' distance eye chart is made on non-reflecting, matte finish cardboard and has a brass eyelet for wall mounting. This classic visual acuity chart measures 11" wide by 24" high. The Suellen's letters are designed to be read at a standard testing distance of 20 feet. We are leading Manufacturers, Exporters, Importers, & Traders of Vision Chart. We provide Vision Chart to our client with best quality and price.